Mining (a document) for genealogical gold. I started my family history journey 30 years ago, specifically when I became interested in the Jewish side of my ancestry. I knew very little. My father (Franklin) was an only child, and both he and his mother (Vera Elstein) had died by then. Plus, his parents (David and Vera) had divorced when he was quite young and no information about his biological father was ever forthcoming. I knew from David’s marriage certificate that his father’s name was Myer Berkman (b. Minsk) and that his mother’s name was Adela. Her surname was not particularly legible but my best guess is Vaskoboynik. At some point, I requested death information from the Province of Ontario and got a computer generated extract with the basics: name, date of death, parent’s names (no maiden name for mother). At the time, I’m not sure that one could request a photocopy of the actual death certificate and that it contained much more information of interest to genealogists. Note the typos (“BERKHAN”, “BECKMAN”), the place of death as Cornwall, and undetermined marital status. A few weeks ago, I submitted an online request and received the full statement of death. It sent me off on a research journey and I seem to have discovered a branch of my family of which I was not aware. The first thing I noticed was that David didn’t die in Cornwall as per the extract, but rather in Hawkesbury Ontario, and that his place of permanent residence was the (now demolished) Manitonna Hotel in Brockville. Originally a furrier, he had also been a merchant in ladies wear and millinery. So I supposed that he might have had a store in Brockville. While I was driving through the town on my way home from Montreal, I dropped by the Brockville Public Library and perused their business directories from the 1950s but couldn’t find him there. The marital status field was not filled in, but the name of his ex-wife Vera (my grandmother) was there. I also noticed that the informant on the certificate was described as a nephew. This would imply that he had at least one sibling. Unfortunately, the signature of the informant is illegible. I noticed from the certificate that he had been in Hawkesbury for a month when he died, and that he hadn’t worked for much of the previous year. So maybe he was living with this nephew. 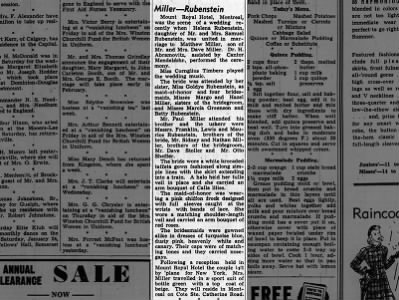 I did a Google search for [berkman hawkesbury] and the first hit was a Sadie (Berkman) Rubenstein (born Russia), who gave birth to a number of children in Hawkesbury after marrying Samuel Rubenstein in Montreal. And then I remember the legal matter. In going through my father’s papers with my mother a number of years ago, I found an agreement dated 1957 between my father (Franklin Berkman) and a Frank Rubenstein (living in Kingston), regarding David’s estate. There seems to have been some issue with the settlement of the estate and my father would have been his father’s next of kin. Back to Ancestry.ca and I find Samuel and Sadie Rubenstein’s first child was named Frank. The place of death address on David’s certificate was their home in Hawkesbury. Sadie had (I believe) nine children. I spent some time finding marriages for (some of) them, births of children, death dates, etc. And it would appear that I have some second cousins living in Montreal. I used a couple of newspaper sites to search for marriages and obituaries. Here’s an example of one for one of Sadie’s children, Helena. This experience underscores the importance of locating original documents when doing genealogical research. I was able to discover an entire clan based on a couple of addresses and names, and the word “nephew”.